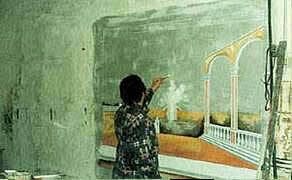 The fresco artist must start applying his colors on the wet plaster as soon as it has been prepared and laid on the wall. The colors are absorbed by the wet plaster and when they dry and harden, the colors and the plaster become one. 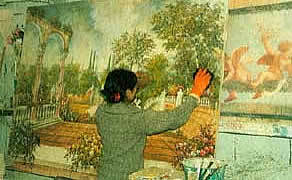 Due to its chemical properties, fresco painting is the most permanent painting technique known and the painting becomes the integral part of the wall or panel it is painted on. In frescos the pigments are bound into a crystalline structure with the limestone instead of simply adhering to the surface like all other painting techniques. The colors in fresco must be applied during the formation of limestone crystals and, depending on the skill of the mason and purity of the materials used, the painting must be done anywhere between 2 and 10 hours. Large frescos can only be painted in sections. Each section must be completed on the same day and if the result doesn’t meet the expectations that part of the painting must be redone from scratch. The size of each section is determined by the artist depending on the complexity of the subject and the number of details. The fresco technique can give splendid results, but it requires long experience and the ability to paint in a self assured and rapid manner. Slow progress and corrections are just not possible. 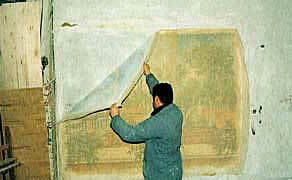 After being painted on a wall, the fresco can be removed from where it was originally painted and transferred onto canvas. 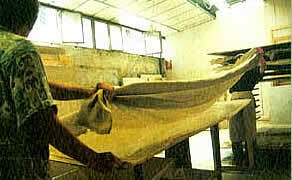 This method of "strappo da muro" (pulling of the fresco) is called "Calicot". This operation has to be done when the fresco is completely dry. 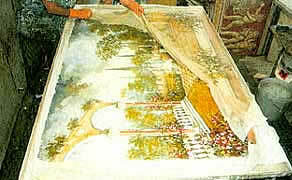 A canvas is glued to the wall with special water-soluble glue and, when the glue is dry, the canvas is pulled from the wall. 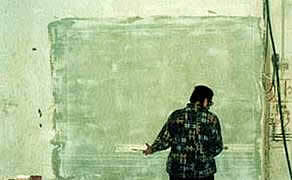 By doing this, the painting is removed from the wall and remains on the canvas. The removed canvas is glued to another one with permanent glue. 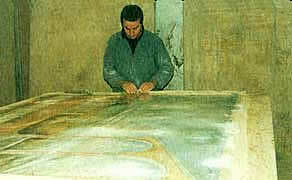 The first glue is dissolved, the first canvas removed, and the fresco remains on the second canvas. At this point the fresco is touched up, aged, and put on a frame. 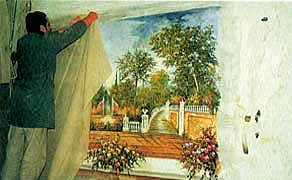 A fresco can be hanged like a painting or can be glued to a wall for a more dramatic effect. In either case, an authentic fresco, with its unique tones and tints, provides unmatched charm for any ambient. With the co-operation of “Masters of Art”, all with prestigious background, we can bring to you a unique collection of beautiful frescos in any size and design, guaranteed with a quality and authenticity certificate.